I’m typing this piece from a large, empty house in Boulder. Downstairs a couple of guys are repainting the interior and we should go live on the MLS in a little over two weeks. From concept-to-reality, it took me eight months to arrive at this position. I’m on track for changing my life situation. Despite living in nine countries, this is the first move where I’ve been an active participant. Typically, I use money and other people’s time to insulate myself from the move. Given that I was the only person that wanted to move in the first place, I figured that I would step up. Besides, the first quote from the moving company gave me a meaningful financial incentive to get organized. take everything apart in advance – I had a couple items that I could have broken down further and that cost me a couple hundred in time costs. Taking apart a commercial-grade treadmill was an exercise! Despite my efforts at downsizing we have the equivalent of two 40-foot containers worth of stuff spread between two properties. During the move, I came across the photo above. 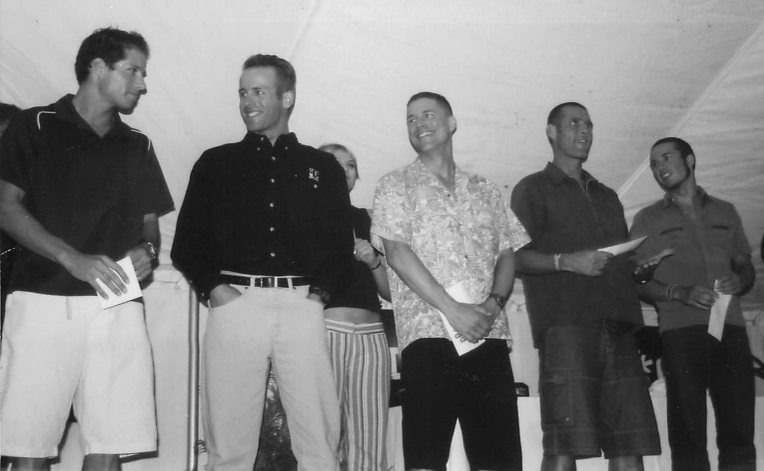 It’s a picture taken at the Award’s Dinner at Ironman New Zealand many years ago. I might be the only guy without an Ironman victory in the shot. It was a strong field that year! In the picture, you can see Steve Larsen. Steve’s not with us anymore and he’s survived by five kids. When I came across the photo, I thought of Steve’s kids and wondered if he would have lived differently knowing that he would die young. The answer to that question isn’t important but it drew my mind to my own childhood. Growing up, one of the houses I live in was an honest-to-God mansion. The house was purchased in an estate sale and my parents didn’t have enough furniture to fill it so part of it was closed off and only used for parties or fashion shoots. From the top of the mansion (it had three floors) you could look north and see snow on the local mountains. I thought about all the different places that I’d lived as a kid and whether one was “better” than another. Considering each place, what stands out was the mood of the family, rather than the splendor of the property. In fact, some of the happiest times of my life have been spent living in tents, cabins and the spare bedrooms of friends. Thinking deeply, convenience trumps capital value and what I remember is the mood of the people around me. If we get an acceptable offer and sell, then it will be interesting to watch how I spend my time. I’m chipping away at removing all my excuses for the duration of my kids’ pre-school years! At any age, the death of a parent is a traumatic event. Reflecting on my own mortality helps me appreciate each day.